Reference number for this case: 25-oct-54-Acheux-en-Vimeu. Thank you for including this reference number in any correspondence with me regarding this case. "...conversely an interessant phenomenon which left traces and was mentioned in the press is not listed by the ufologists, because the journalist used neither the word UFO, nor the word flying saucer. 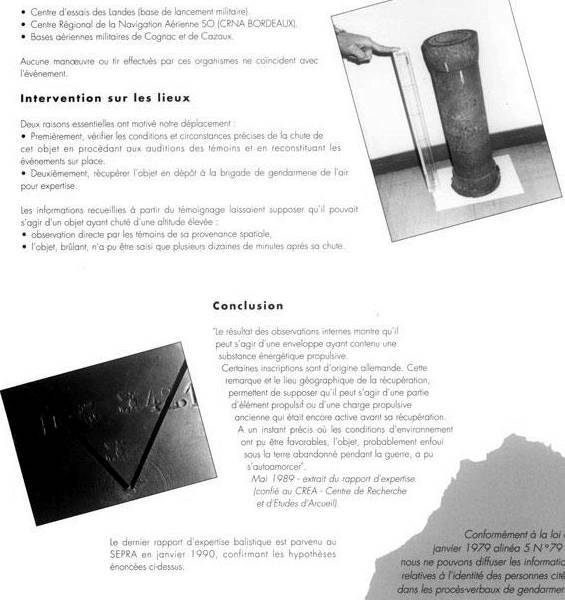 As an example a Picardy case of 1954 "the phenomenon of Acheux" (UFO with traces in Acheux in Vimeu). I challenge you to find it in the files of the ufologists." He specified to me that he used OCR software to get the transcript; which he uncovered around 1978, in the archives of the city of Amiens. He adds that "Bresle et Vimeu" is the name of the newspaper which is published in the Vimeu region, in Picardie. The article was on page 4 of the 10.31.1954 of the newspaper. He added that the case reminds him of a famous similar case studied by GEPAN. I agreed, see the notes for reference. "Should we say "saucer"? Should we say meteor? Should we say atmospheric phenomenon? What is certain is that a very curious fact occurred last Monday, October 25, at about 13:30. It does not rest with to us to characterize the thing. But here is exactly what happened. Mr. Maurice Leclerc, aged 19, son of Mr. and Mrs. Leclercq, shoppers and newspapers stand owners, in the city, had left Acheux to go in the district of Zoteux, to see his sister there. There were, at some times, thunderflashes, but no thunderclaps. However, travelling by bicycle, the young man was suddenly surprised by a large gleam, which illuminated part of the field exploited by Mr. Alfred Niquet and of which Miss Dufètelle-Thibaut is the owner. Sparks spouted out of the ground and one had thought there were vibrations. No noise however. But, suddenly, a gleam amounted vertically at 15, 20 or 25 meters in height - it was difficult to evaluate exactly - and disappeared in a snap. A bit shaken, Maurice Leclerc returned at his place and informed everyone of what had just occurred. The following day, at about 1 o'clock, one went with Mr. the Secretary of the Town Hall and some people sought if some vestiges remained or an unspecified machine in the field and, not within 60 meters of the road as the young man had believed, but within nearly 200 meters, one noted that the ground was entirely burnt on 3 square meters approximately, the flint stones themselves being almost pulverized and having become friable. What is the actual cause; what is the nature of this phenomenon, that is what one is unaware of up to now. I want to thank longtime ufologist Dominique Caudron for providing the case. Dominique Caudron suggested that a famous SEPRA case of similar characteristics. Very likely the explosion of old flares. Maybe the thunder played some part in this. [---] Article in the newspaper Bresle et Vimeu, France, page 4, October 31, 1954. [dc1] Post in a newsgroup under the pseudonym of "Oncle Dom" to "Mco" read on the Internet by the author of this page in 2004. [dc2] Email correspondence from Dominique Caudron to this website's author, 2004. 0.1 Patrick Gross October 21, 2004 First published. 1.0 Patrick Gross January 29, 2010 Conversion from HTML to XHTML Strict. First formal version.